After a walk in the park, and with a big sigh, I have to return to the subject mentioned as ‘breaking news’ a couple of weeks back — plans for the housing development at the football ground. As I’ve previously mentioned, this is close to home and quite a difficult thing to cover, because of my awareness of the significance of it on many levels, but particularly to York City fans, and to some of us living close to the ground for a long time. Many layers of meaning and memory here at the city’s football ground. But I certainly can’t ignore it. And there are many approaches to it, so let’s get on with it. Some aspects need highlighting as the cultural heritage of this site needs wider recognition, and there is an opportunity at present to send comments to the developer, Persimmon. Currently we’re in the ‘pre-application’ stage, before a planning application is submitted. 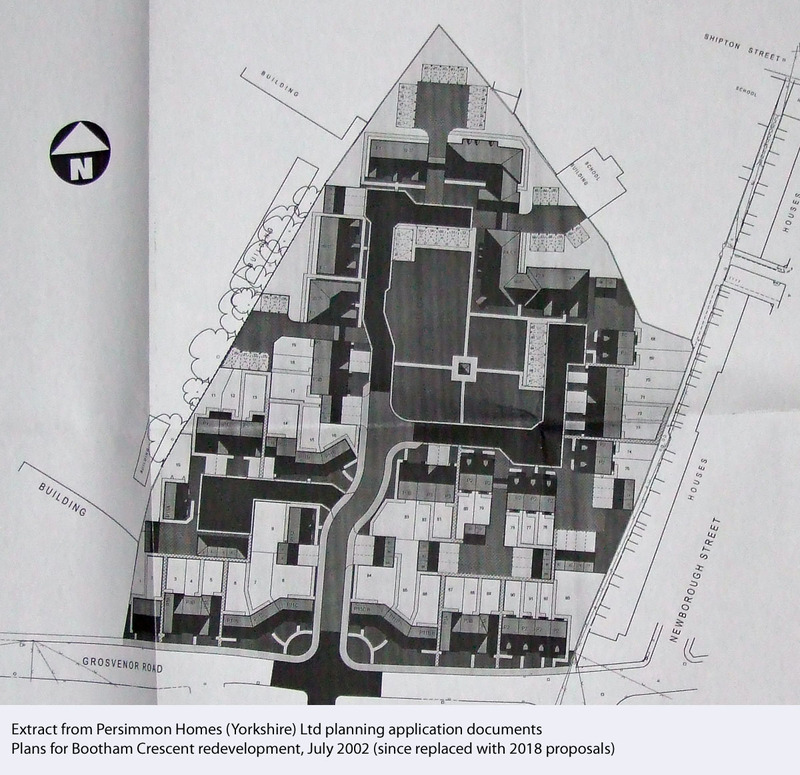 City of York Council’s Statement of Community Involvement (SCI) recommends that developers undertake public consultation on major projects, such as this proposal, to inform the detail of the development prior to the submission of an application for planning permission. This consultation is being undertaken in accordance with the Council’s SCI. … Your comments will feed into the development of the scheme that will be submitted to the Council. We will produce a report which will form part of the planning application, and it will summarise the issues that you have raised with us during the consultation period. It will set out any changes made to the proposals in response to your comments. If you suggest changes which cannot be accommodated the reason(s) for this will also be set out in the report. Some readers, particularly if they’re fans of York City FC, may remember an earlier Persimmon planning application (ref 02/02212/FUL), back in 2002, during particularly bleak and grim times. The documents aren’t available online, but I’ve been looking at photocopies. It’s interesting to see how the plans for the same site have changed, 16 years on. In the 2018 plans, the entrance to the development has shifted, with the access road in a different place. 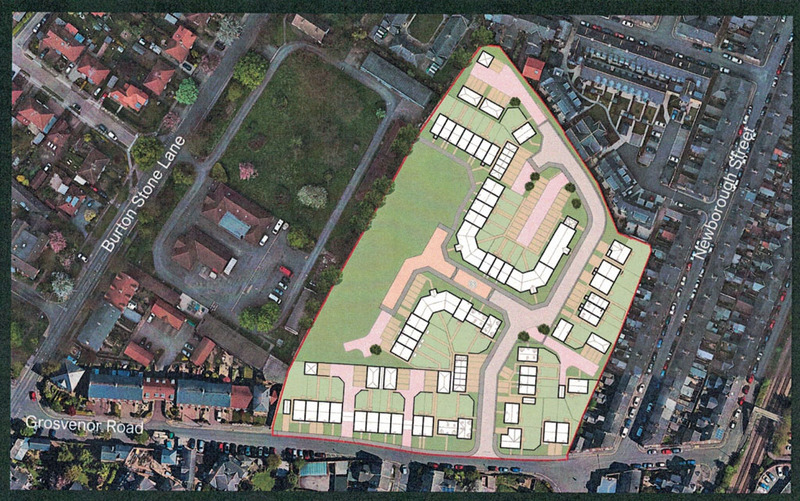 Fewer houses/flats are proposed for the site. The proportion of houses to flats is very different. And the green space has shifted from a fairly central position to one side of the site. Compared to the planning application in 2002, fewer homes are proposed for the site: around 80 now, rather than the 93 back then. It does seem to be the case fairly often with planning applications that having got permission the developers go back and want to increase the number of dwellings, so ‘around 80′ might end up being more than that. More interesting perhaps is that the number of apartments has been reduced considerably. Around 18 is my understanding, compared to 48 apartments in the 2002 plans. The apartment-building boom of the previous decade presumably provided enough apartments elsewhere in the city. The other noticeable changes from the 2002 application are firstly, the placement of the access road, and secondly, the placement of the green space. The first of these might matter only to local residents around the ground. The green space is of more significance and interest, or should be, because this piece of land has always been green space of some kind, though the terracing and the stands and the car park have covered the edges of it over time. In the 2018 proposals the green space has been positioned to the west side of the site, where the Popular Stand is (popularly known as the Pop Stand). 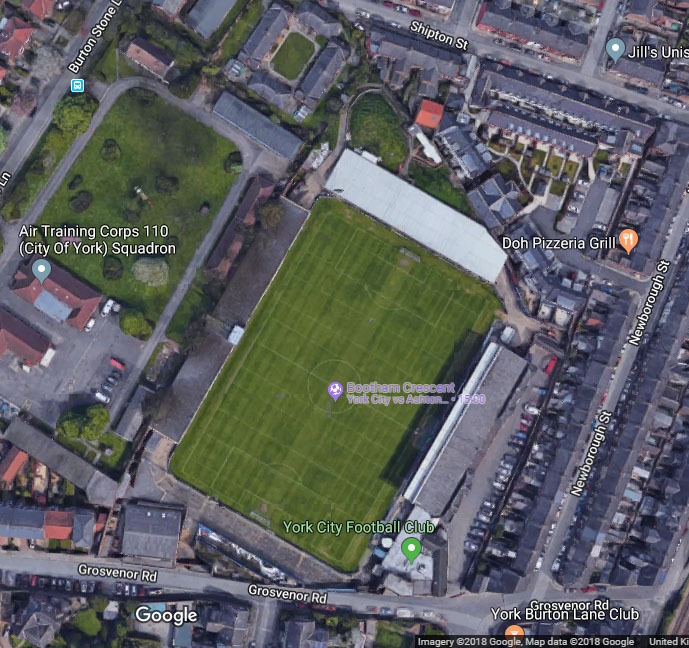 The proposed green space extends to the football ground’s boundary with Duncombe Barracks, where there’s a line of mature trees very close to the back of the stand, on the barracks side of the boundary. A representative from Persimmon told me that this relocation of the green space came from pre-application discussions with the council’s planning department. The barracks site, owned by the MoD, is now surplus to requirements, and according to the city council’s website the council are interested in buying it for housing development. If it is also redeveloped for housing, a larger area of open space could be made around those mature trees. That appears to be the thinking. If so, and if leaving space around the trees means the remaining trees are kept, then that’s a good thing. On the other hand, as I mentioned in an earlier page, it seems important to have at least some green space more centrally located in the new development, part of where the pitch has been for all these decades. Some kind of proper marker and recognition. It would be better if this recognition of the city’s sporting heritage wasn’t in the middle of someone’s front garden. Football grounds like this aren’t like other bits of land. They have communal significance, deep meaning and memory, for generations of people. I think we all recognise that. Many generations of people have watched sporting events here. Including, recently, some very exciting rugby league games, when York City Knights have entertained a ‘bouncing Bootham Crescent‘ crowd. So it has recently served as a rugby ground and for decades as a football ground, and before it was a football pitch it was a cricket pitch. From the thecardindex.com website, a couple of lovely images of this piece of land, back then. 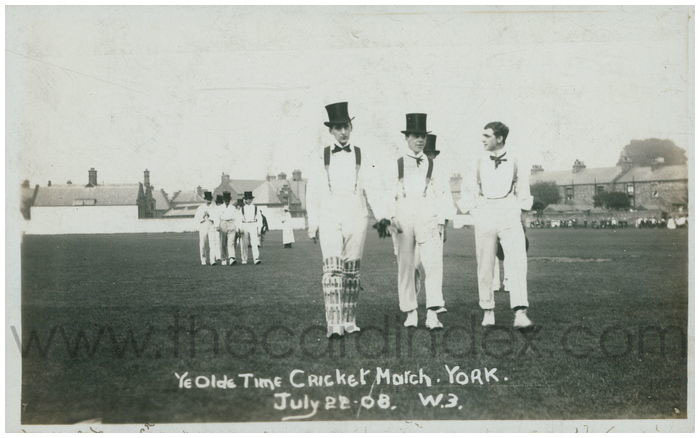 ‘Ye Olde Time Cricket Match. York. July 22.08.’ From thecardindex.com, on this link. 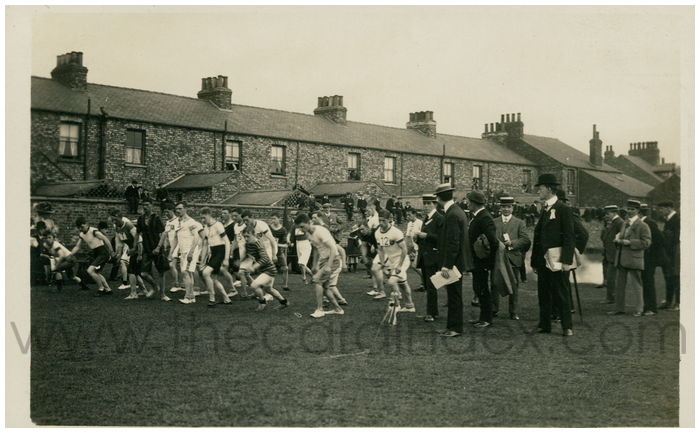 Not cricket, but apparently a running race about to start, in what looks like the area that is now the football ground’s car park, with Newborough Street in the background. And before it was a cricket pitch and sports ground it would have been fields … but there are no available photos of that. The distinctively shaped site is included on the 1852 map. Whether as a wilder place or the carefully maintained grassland of a sports pitch, this piece of land has been green for centuries, but not for much longer. Thinking about the planning application from 2002, looking at photocopies of it, reminds me of how close the football club was to losing its home back then. I think about how that was resolved, back then, and how Bootham Crescent was saved ‘for the foreseeable future‘. How resonant that phrase seemed at the time, and still does, though that future held a lot of things that weren’t foreseeable after all. And how ‘foreseeable’ ended up meaning a ten-year period, how ten years seemed like such a long time, and then ended up being longer than that, with the various delays to the building of the replacement stadium, out at Monks Cross. A valuable piece of land, and it can be viewed in so many ways, as plans for its future become clearer. Residents might look at the plans for the site and think about the increased traffic, and parking problems, and the noise and dust from the demolition and the building site, and the usual concerns residents have when such changes are proposed close to their homes. Persimmon are there to build houses and make profit, and of course if it wasn’t them it would be another house builder. For many York City fans there’s a deep and significant sense of loss in this, a feeling of losing a home. So — no actual planning application yet, in this ‘consultation’/pre-application stage — but if the above has inspired any thoughts on how this piece of land should look in the future then you might want to send them to yorkshire.land@persimmonhomes.com, by 11 October 2018. Might be a good idea to put ‘Bootham Crescent’ as the subject, as that looks like a fairly generic email address. I suspect Persimmon own a lot of ‘yorkshire.land’. It took a while to write this, to get the tone right, to get the facts in. It’s not fun, thinking about this. Please send coffees. Seriously though, if you’d like to support this site there’s more information on this link. Please keep any comments as calm and thoughtful as possible, in recognition of the fact that I created a page that was as calm and thoughtful as possible, and that this is my website, which is like an online home, of sorts. I’ll probably have to remove anything that’s too angry/derogatory about individuals/rude about Persimmon, so please do any sweary/angry/personally defamatory stuff on social media, not here. Thanks. In recognition of the heritage significance of the ground, Historic England has a project running at present led by heritage consultant Jason Wood. It will ‘explore what people value about the place and will consider how those memories might be captured for the future’. Fans and locals are urged to get in touch with Jason (jwhcs@yahoo.co.uk) with their memories of the ground and ideas for its re-development. There’s more information on the football club website. Thanks to Claire who alerted me to this project. Parking is indeed an issue: we, in Newborough Street were polled last year to ask if we wanted Residents’ Only Parking (the Council even painted parking boxes on the street!) but only 11 out of 93 residents voted in favour. The double yellow lines opposite the former Pickering Terrace, (now Bootham Green) were ostensibly for the contractors’ vehicles back in 2013. They’re still there. The proximity of the Hospital results in the staff parking in Scarborough Terrace/Newborough Street. I don’t blame them; they have to pay for the luxury of parking at work, so from my point of view it’s a case of waiting until 5pm on the double yellows and pounce when the opportunity arises!